Q#1: Are you a Bay Area Native? and if not, how long have you lived in the Bay? Mama Ayanna: No i’m not a Bay Area Native although i had a spiritual affinity with the Bay Area and i knew i was going to live here since i was a child. i have lived here in the Bay Area for most of my life, for over 40 years. My family has lived in the Bay Area since about 1860 or before. Q#2: When did you start on the creative path you are currently on? Mama Ayanna: My current creative path began as long as I can remember. As a child i would talk and walk with the Ancestars. i was also able to talk to animals and considered myself their protector, going around destroying traps and leaving food for animals in the wild. i and my sistars used to play in the woods, by the streams and ponds where I grew up, so i developed a relationship with the natural world at an early age as well. i was raised in a family with organic gardeners and farmers and grew up a an ecologist. i began writing poetry when I was nine years old, but didn’t step out with the spoken word until I was about 23 or 24. i entered my life as an activist at the age of 18 and joined the Pan African Student Union when I attended San Francisco State. I became a member of the National Black Human Rights Coalition shortly afterward and was a founding member of Black August in 1979. I began producing at KPFA in 1985. i was also a founding member of the Oakland Chapter of the Malcolm X Grassroots Movement in 1993. i have worked with and formed several women’s organizations including New Afrikan Women for Self Determination and the Conscious New Afrikan Women’s Healing Collective which created the Black Women’s Retreats and the Black Women’s Health and Healing Conferences. i find no separation between the political and the spiritual life. It is all life. As a mother of 7 children (6 sons and 1 daughter) it was important to me to work for the betterment of my community in to try to leave the world a better place for them and for the generations to come. My level of spiritual leadership began to evolve when i (along with Rashidah Tutashinda) put the call out for a sistar’s healing circle and our first circle brought together about 60 women. i have been leading spiritual ceremony and participating in healing and talking circles since then. It was also during that time period that I began my spiritual study starting with Babalawo Fagbemi Ogundele and other spiritual teachers. Shortly after that I began to practice as a medicine woman. I was initiated into leading the “Sweat Lodge” or what I the “Purification Lodge/Ceremony” was part of my spiritual path. My path really intensified when i (and Shaka At-Thinnin) opened our business “The Flowing Gourd”. It was one of Oakland’s first “green” businesses. i began practicing herbalism and aromatherapy. From that point on, my practice evolved as my knowledge evolved and Ayanna’s Magic Garden evolved from “The Flowing Gourd”. i received my Masters in Traditional Chinese Medicine in 2007. i am currently natural and Holistic Health Practitioner, Herbalist, Aromatherapist, Nutritionist, Massage and Tui Na Therapist, Doula and Spiritual Life Path Consultant. Q#3: Where do you find your inspiration? Mama Ayanna: i find my inspiration in nature, especially from the ocean, the Bay, the rivers and mountains of California. i also get my inspiration through daily meditation, from the love of my man, the love of my family, and from my wonderful community. i am especially inspired by how much creativity and genius i see and experience among the young people in the Bay Area. Q#4: What was the first piece of vinyl you ever purchased? Mama Ayanna: i believe my first 45 was Dionne Warwick’s ”Walk On By” (i still think i can sing like Dionne Warwick, lol). My first 33 was Wes Montgomery “Bumpin On Sunset”, such a nice piece. I’ve been listening to Jazz and Blues since i was a child. i remember singing Billie Holliday’s “Motherless Child” when I was 4 or 5 years old. Mama Ayanna: “i believe in living. 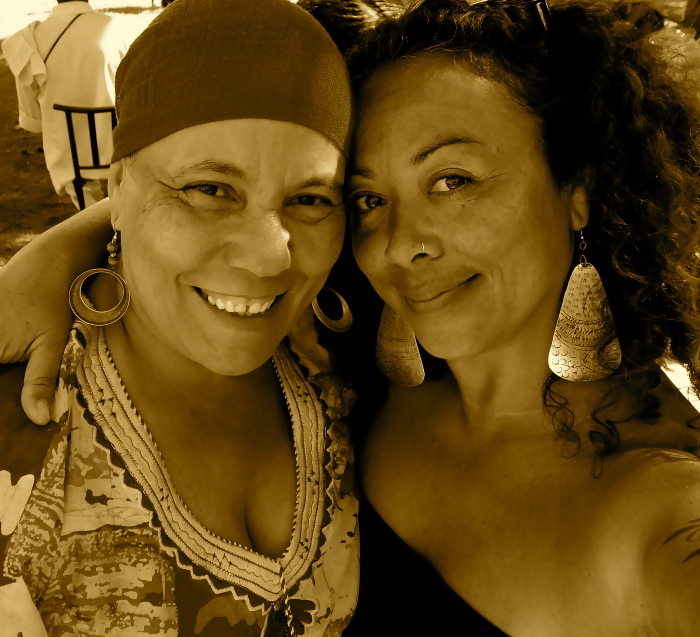 Pingback: Black August: The History, Culture and Practice w Mama Ayanna Mashama | imixwhatilike!